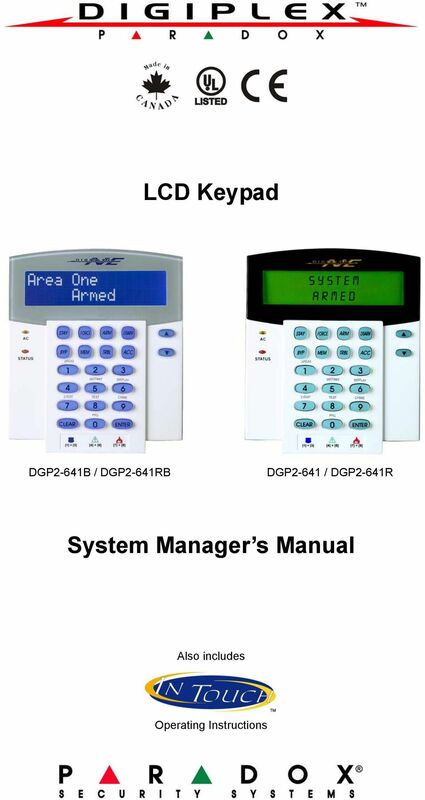 Download "System Manager s Manual"
6 2.2 Confidential Mode Your installer can program keypads to not display the status of your system automatically by changing the LCD screen to Confidential Mode. 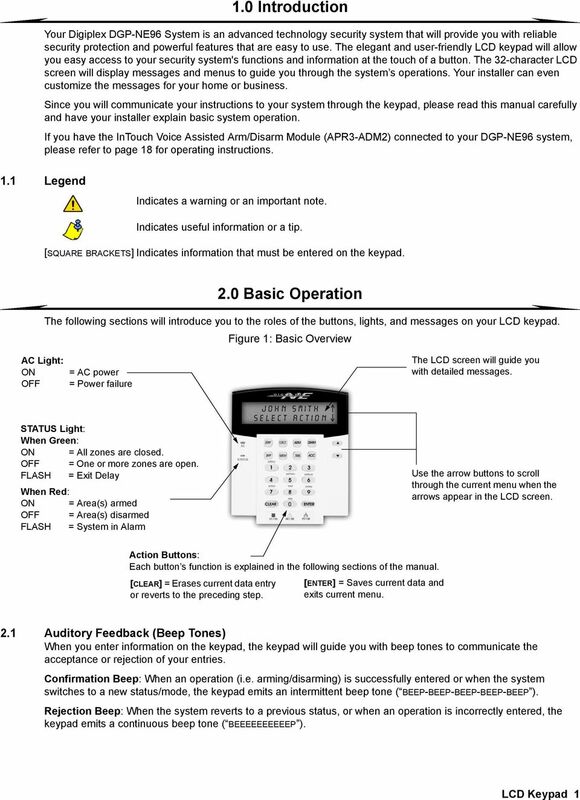 In Confidential Mode: The zones and status messages will NOT be displayed The indicator lights will NOT illuminate Depending on how your keypad was programmed by your installer, you must either press a button or enter your user access code to illuminate the indicator lights and activate Normal Mode. 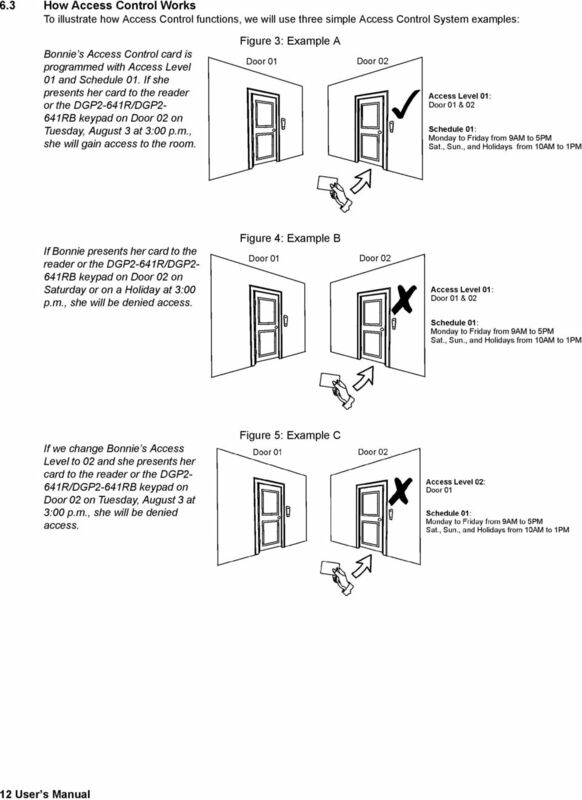 2.3 Partitioned System A separated system is called a Partitioned System, which can be useful in situations where shared security systems are more practical. Your installer can design your system to recognize up to eight separate protected areas. 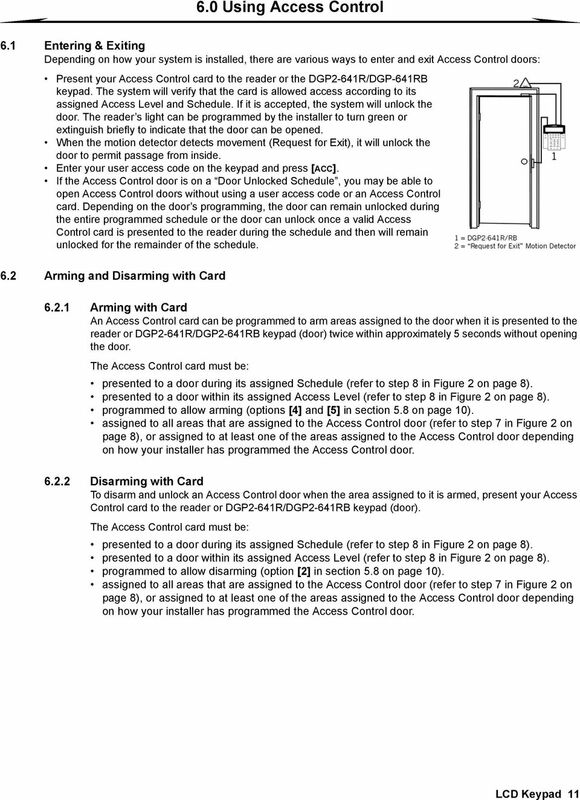 For example, a company that has both an office area and a warehouse area can arm and disarm each area separately and control the access to each area. 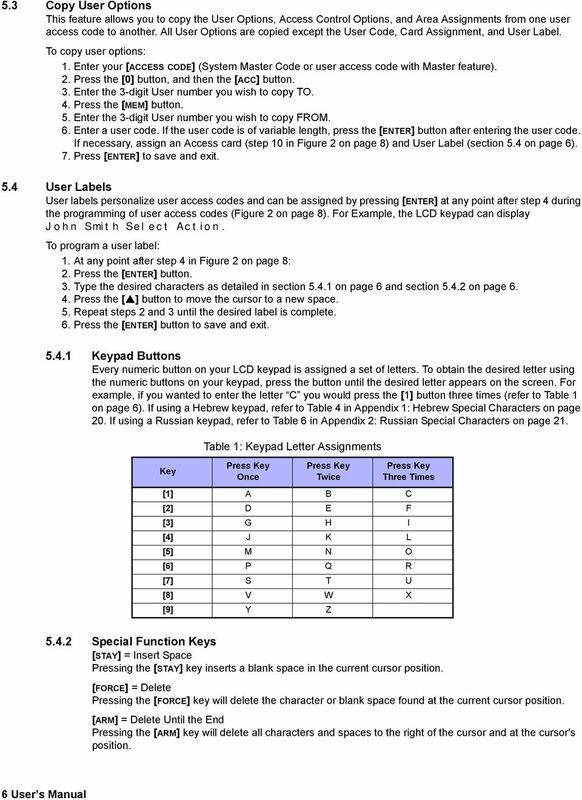 If you have access to more than one area, and you need to select a specific area(s) when prompted by your LCD keypad, follow either one of the following three methods to make your selection: Press the keypad button corresponding to the area you wish to select (i.e. 1, 2,...8). Press the  button for all areas. Use the [ ] and [ ] buttons, and press [ENTER] when the area you want to select appears on the screen. 2.4 Area Status Display The Area Status Display allows you to view the status of the selected areas in a Partitioned System (for more information, see section 2.3 on page 2). To view the status of the areas: 1. 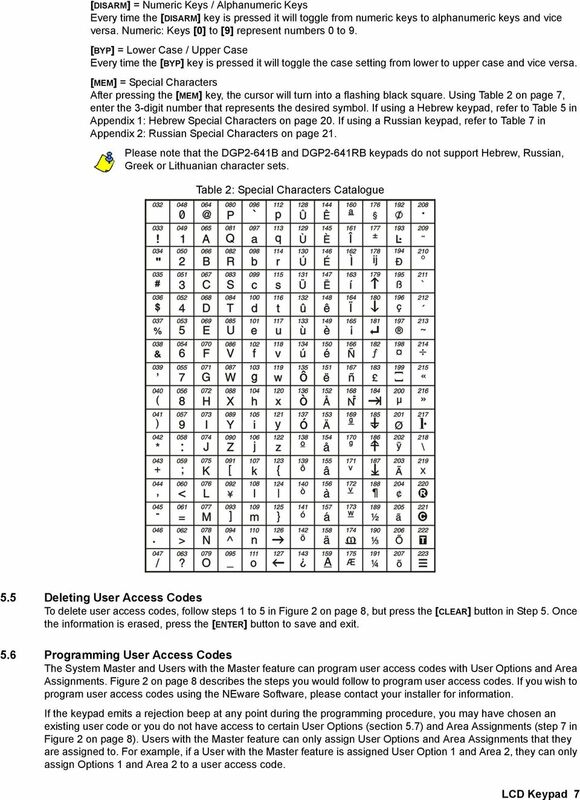 Enter your [ACCESS CODE], and then press the  button. 2. Press the button corresponding to the area (i.e. 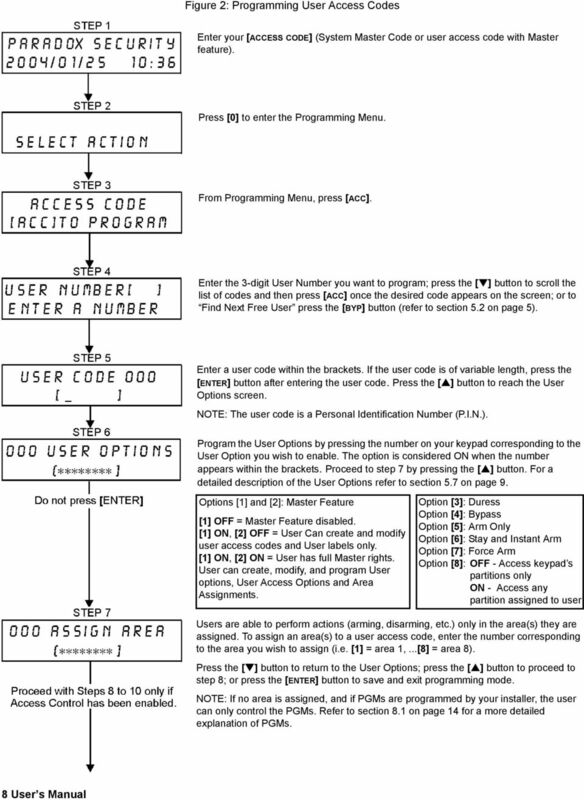 1, 2,...8), or use the [ ] and [ ] buttons and press [ENTER] when the area you want to view appears on the screen. 3. Press [CLEAR] to exit. 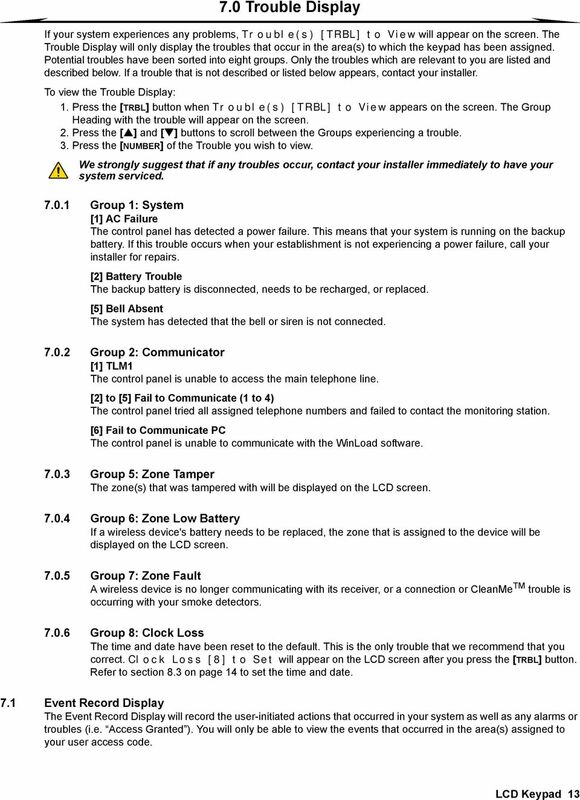 In Area Status Display mode, the following information will scroll on the LCD screen: ready: if all zones in the selected area are closed. not ready: if zones in the selected area are open. open zones within that area (i.e. Front Door Open). Trouble(s): (section 7.0 on page 13) if a trouble has occurred. 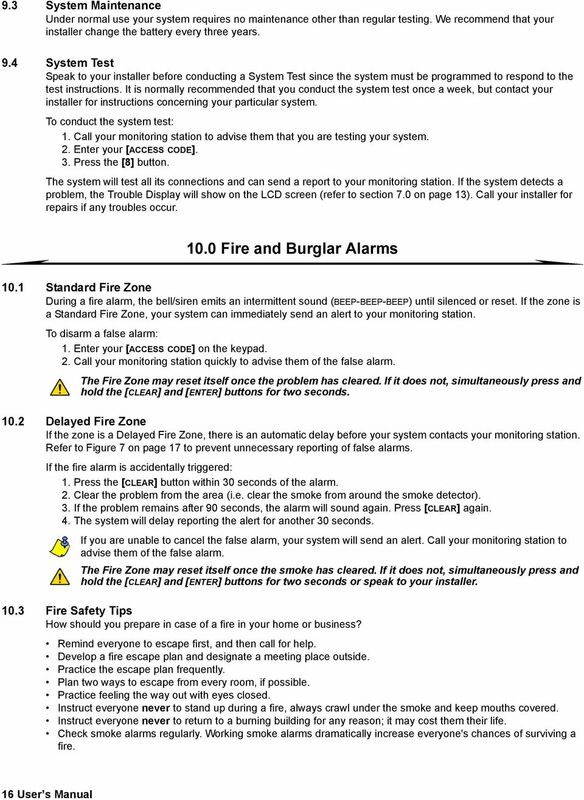 Alarms in Memory: (section 4.3 on page 5) if an alarm has occurred. 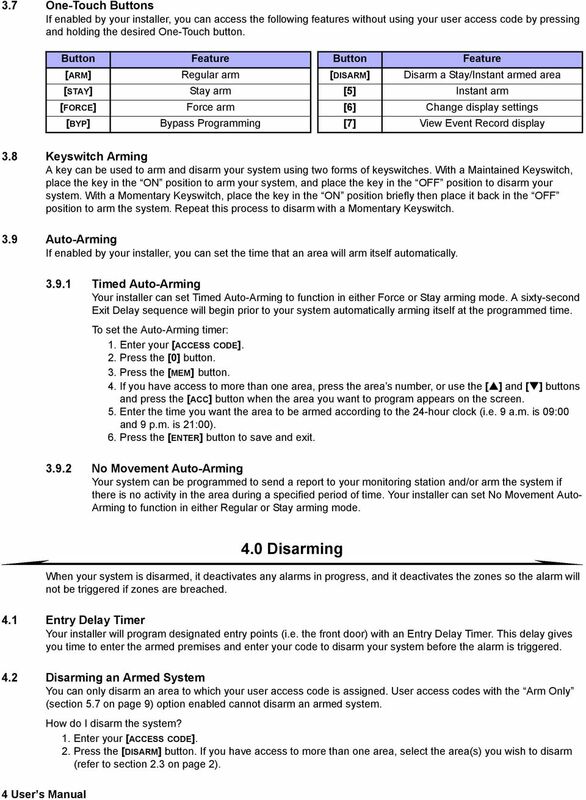 Armed; Force Armed; Instant Armed; Stay Armed: displays the arming status of the selected area. 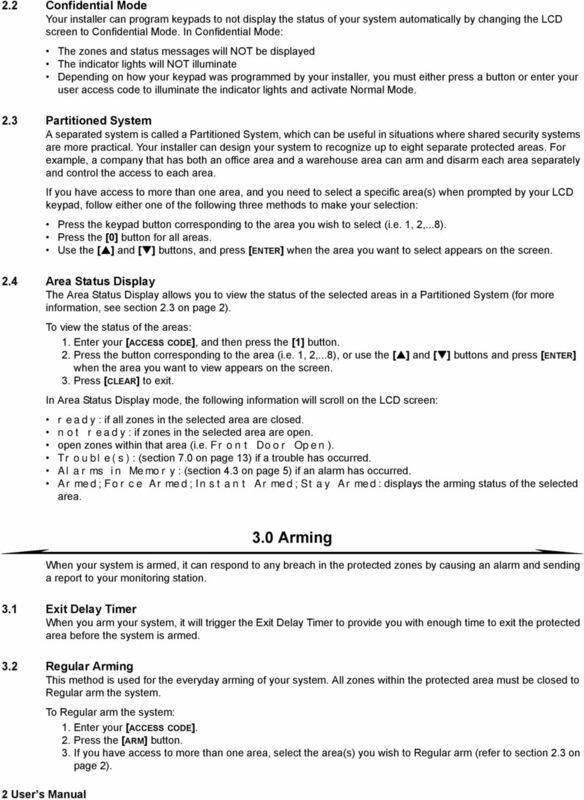 3.0 Arming When your system is armed, it can respond to any breach in the protected zones by causing an alarm and sending a report to your monitoring station. 3.1 Exit Delay Timer When you arm your system, it will trigger the Exit Delay Timer to provide you with enough time to exit the protected area before the system is armed. 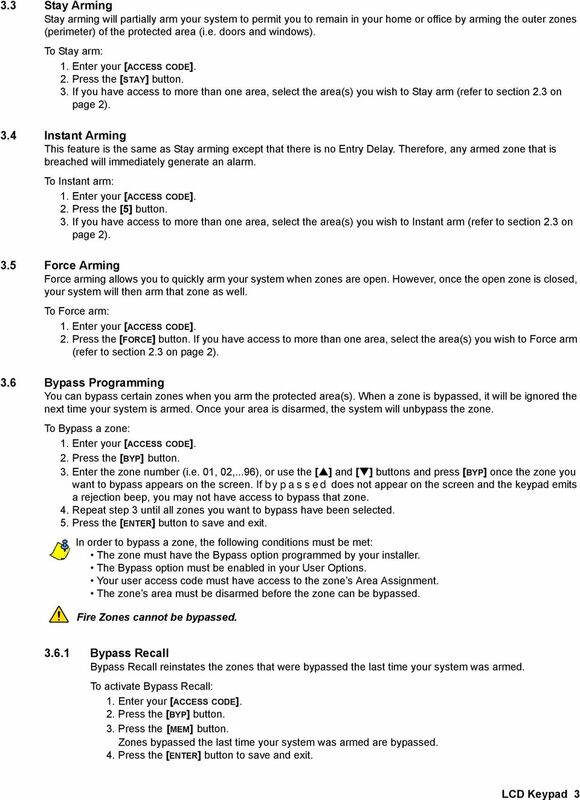 3.2 Regular Arming This method is used for the everyday arming of your system. All zones within the protected area must be closed to Regular arm the system. 2 User s Manual To Regular arm the system: 1. 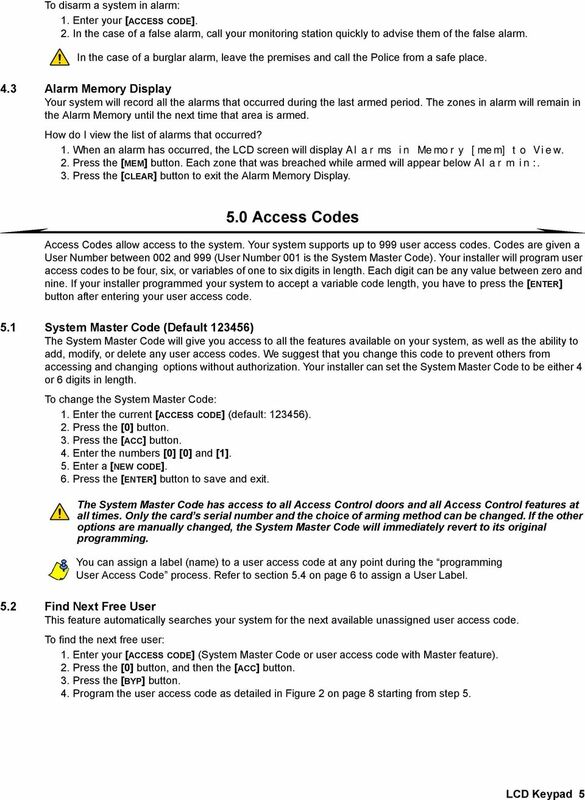 Enter your [ACCESS CODE]. 2. Press the [ARM] button. 3. 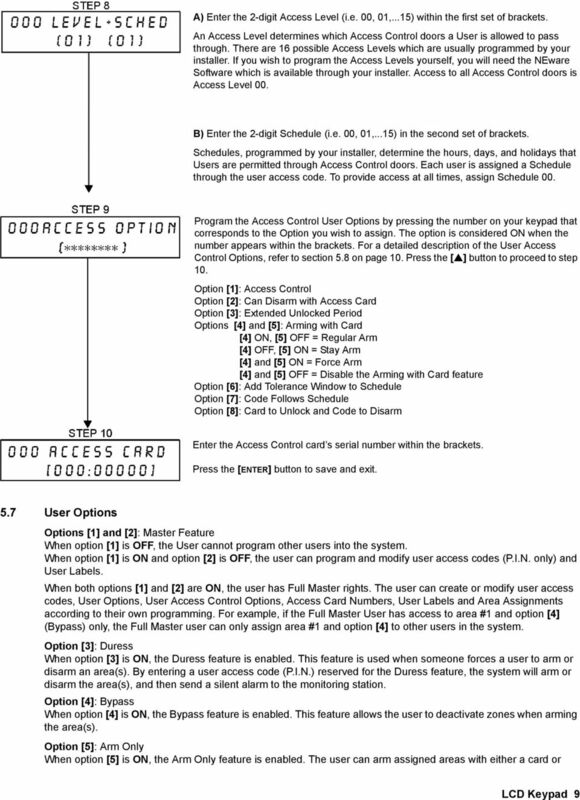 If you have access to more than one area, select the area(s) you wish to Regular arm (refer to section 2.3 on page 2). 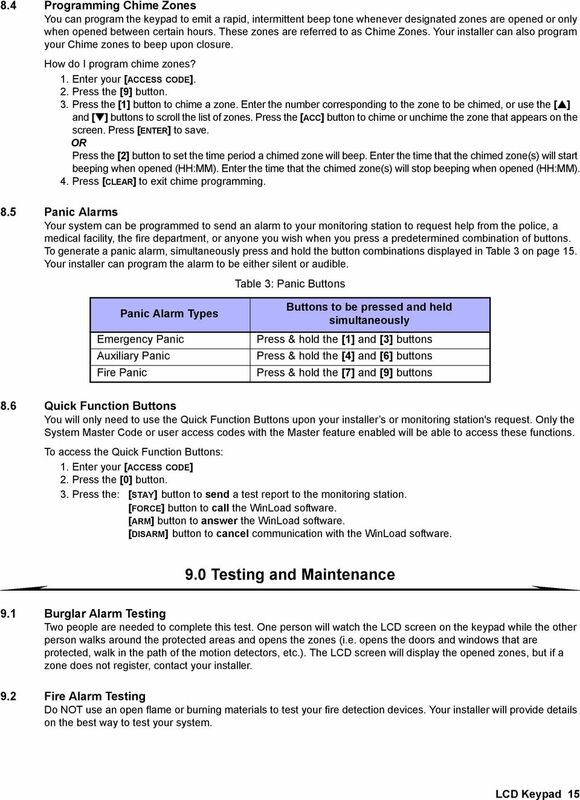 Control panel software versions 2.00 and beyond. Magellan All-in-one Wireless Security System MG6250 Console User Guide Warranty For complete warranty information on this product please refer to the Limited Warranty Statement found on the Website www.paradox.com/terms. FIRE DETECTION Note: Your installer must enable the fire detection portion of this equipment before it becomes functional. ELECTRONIC ENGINEERING LTD. PowerWave-16. 16 zone Control panel Communicator. 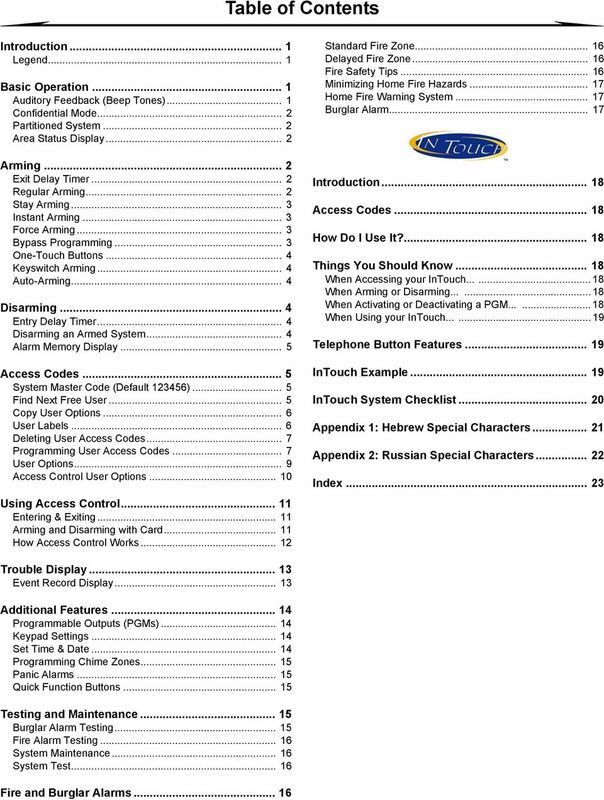 User s Operating and Programming Guide. 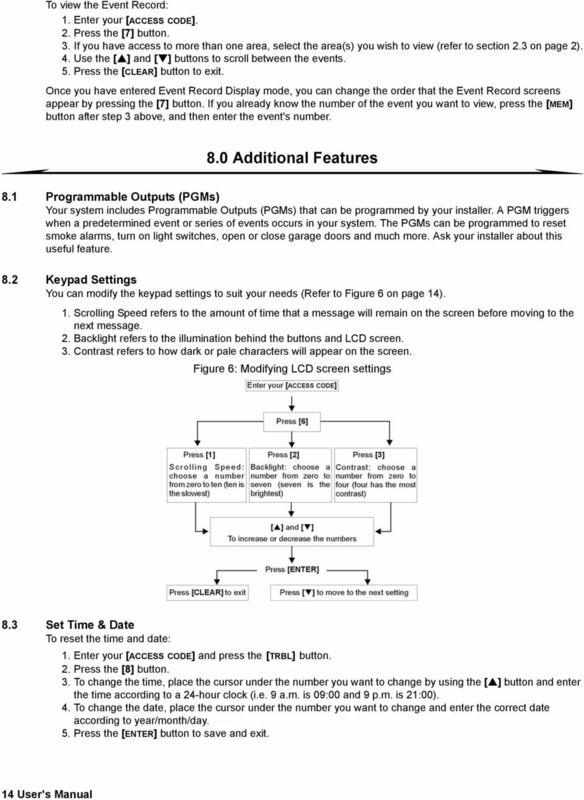 Version: 6.